Last week, on Friday, November 3, the House passed H.R. 3922, the CHAMPIONING HEALTHY KIDS Act, by a vote of 242 – 174. The legislation includes much-needed funding for the Children’s Health Insurance Program (CHIP), Community Health Centers, and other healthcare programs. 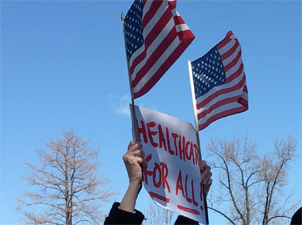 Unfortunately, it also included deep cuts to public health funding, risky changes to Medicaid and Medicare financing, and new barriers for families to access affordable health care coverage in the private marketplace. It is unacceptable to pay for children’s coverage with cuts that will hurt the health of others. “The legislation’s shortened grace periods would hurt low- and moderate-income individuals and families who miss even part of a payment for any reason, such as a costly home or car repair. It would leave well-intentioned consumers with too little time to catch up on premiums when they fall behind and would lock people out of coverage for the rest of the year, raising the number of uninsured. Now, it is up to the Senate to pass a bipartisan bill to extend funding for CHIP without the harmful offsets in the House bill. We urge them to pass the Keep Kids’ Insurance Dependable and Secure (KIDS) Act of 2017 in a bipartisan way. For health policy to serve the common good, we must not cut funding from one group to preserve coverage for another. This entry was posted in Front Page, Healthcare, Policy Update on November 6, 2017 by colleen.